Pie dough is one of those things that once you master it, your life in the kitchen is a happier place. It frees you to make fruit pies, quiche, potpies and anything else, sweet or savory that requires a crust. But, mastering the dough is not always as easy as one would hope. In my first video I’ll show you how I create a tender and flaky crust that make pies delicious, no matter the filling. Then, I follow up with a video on how to successfully roll out, fill, top and decorate a double crusted apple pie. With these videos I hope you’ll be making pie with confidence. 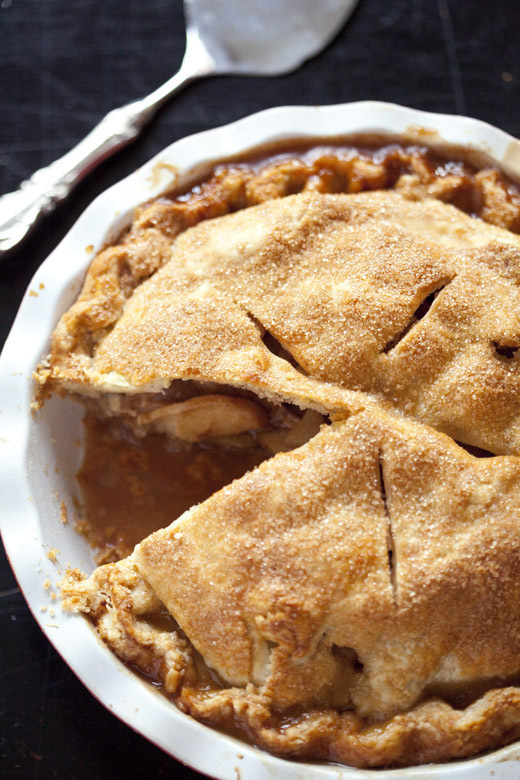 For step by step pictures and the full recipe please visit Best Apple Pie. For more videos on baking and cake decorating you can visit my Zoë Bakes YouTube Channel. Please leave me a note about any pastry videos you’d like to see me do. Great tutorial! This pie looks fabulous. Zoe, I love love love your no-knead books and this website! Your video for making pie dough is awesome!!! I, my whole family love pie so much, but it’s been hard to find a good recipe for dough. Their direction is never easy to imagine, but your video just seriouly taught me how to make it!!! I’m way too excited now!!! Another thing with pie dough is rolling. the crust is so easy! The pie tastes even better than it looks! Had some over the holidays. This is so timely, was just talking about trying to master the elusive pie skills. I will be trying this by day’s end. I’m thinking chicken pot pie for dinner. 🙂 Thanks again, Zoe! Just made a quiche this week with a puff pastry crust. But these videos will be useful for the next one! I have pie crust demons to conquer. Can I use this crust (savory, of course) for empanadas and Jamaican patties? Wow, I learned 2 great tips here. First, roll the piecrust toward the pie, instead of away from the pie when you roll the 2 crusts together? Second, can you always use egg wash and sugar? I don’t want to use milk, and many recipes call for brushing milk on top and then sprinkling with sugar. Egg wash would make it parve. It gives a slightly different look to the crust, but you can use this method for any pie your making. This pie was sooooo good, lard adds a strange flavour, but it is delicious, the best apple pie for sure! And your banana bread was also delicious, everything I make from your page is! Have so much respect for you! Hi Zoe, I just watched your how to make pie dough and apple pie videos and now I cannot locate them. Have they been taken off? They were wonderful and I would love to have them guide me through the holidays!